Read/Write XML File - Welcome to motu4qc-en! The XML format is used a lot and often to changing info between applications or as configuration files on which it is indicated how pages/tables must be created or something else. So it is very useful know how to manage, Read and Write them; let's see how. 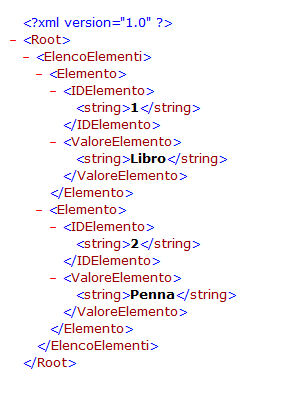 Let's see now how to read from an XML file. Suppose we want to read from the above file all "IDElemento". To do this is possible to use the getElementsByTagName method of the oRootElement object. We'll do a cycle for all oRootElement.ChildNodes and show the "IDElemento" Value.